Pope Francis has been an engaging, prophetic voice tirelessly calling the church to a simple lifestyle of mercy, witness, and collaboration. This new volume in the Pope Francis Resource Library contains the gems from the Pope's reflections on pastoral and priestly ministry. Authorized by the Vatican, the texts are collected from Pope Francis's homilies, speeches, and papers during the first two years of his papacy, as well as from the earlier, exclusive edition published when he was Archbishop of Buenos Aires. 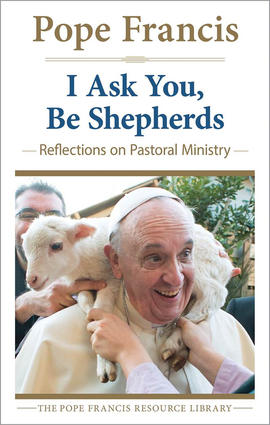 I Ask You, Be Shepherds offers Pope Francis's profound and encouraging appeal to everyone serving God's people today. Pope Francis, also known as Jorge Mario Bergoglio, was elected Pope on March 13, 2013, taking the name after St. Francis of Assisi. His priestly ordination was in 1969, and in 1992, he was consecrated auxiliary bishop of Buenos Aires and given the titular see of Auca. He became Buenos Aires's coadjutor bishop in 1997, succeeded as the see's archbishop the following year, and was elevated to cardinal in 2001. He is the author of On Heaven and Earth: Pope Francis on Faith, Family and the Church; Open Mind, Faithful Heart; The People Wish to See Jesus; and The Power to Serve.